1. It was simply an excellent speech, absent any personal attacks on the Democratic majority. The general tone was businesslike. A State of the State speech, like a State of the Union Speech, is an “agenda” speech, contrary to the complaints of such by a few of the General Assembly Democrats and others. Sure, he won’t get it all passed, but, in any governor’s maiden speech, his or her reach should extend beyond his or her grasp. Agenda speeches do not promise success. Look at any of them, including President Obama’s most recent one. Free Community College? Nope. Much of the Democratic audience for Gov. Hogan was simply unconventionally and unprofessionally rude: Comptroller Peter Franchot applauded frequently, and House Speaker Busch applauded at spots – not problematic, but traditionally when major policy speeches are made and there are references to general values or praise for opposition figures, such as Franchot, or general values, such as improving the environment, tackling the heroin problem in Maryland and fixing the politicized gerrymandering debacle (first recommended by Democratic governor-aspirant Heather Mizeur), the loyal opposition likes to applaud to show comity in mutual support for the city, state or country. After then-Gov. Martin O’Malley’s first State of the State in 2007, Del. Anthony J. O’Donnell, then-House minority leader, merely iterated his disagreement, adding “The governor has the ability to use all the tools at his disposal.” It’s nice to have grown-ups in the General Assembly. This is the antithesis of Gov. O’Malley’s citing of the causes of what he alleged were economic problems eight years ago in his State of the State speech: anti-labor policies. One of the differences between the two administrations being replaced, the Ehrlich and O’Malley governorships, is that there was no cooperation for the former whatsoever, including gambling enterprise initiatives that were easily passed by the O’Malley administration and for which it took total credit. 3. In the Governor’s speech, critical of a lack of transparency, as in automatic raises in the gas tax, he wants to eliminate such policies and supports the preeminent conservative value of responsibility; he demands that no taxes can be raised without the transparency of proposing and supporting such raises. Throughout his speech Gov. Hogan criticizes the state for profligate spending of money and leaving it to future citizens and wealthier taxpayers to pay the price, despite the consequential major egress from the state by businesses and the increasing disaffection with the state evidenced by polls. 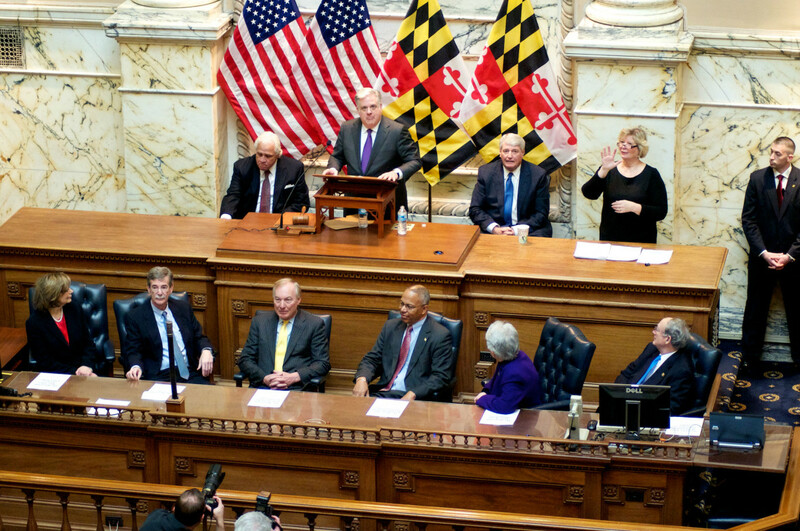 4.House Majority Leader Anne Kaiser, D-Montgomery County, gave a serviceable answer to the State of the State, written, however, without reference to the governor’s speech which preceded it. She supports the state, a well-educated and well-trained citizenry. No harm; no foul. Overall, a great rhetorical beginning, Gov. Hogan. Now is not the time to signal that you are intimidated. This will have nothing but a positive effect on political negotiations going forward. We know from President Obama’s indecisive dealing with foreign enemies what weakness wreaks. Professor Richard Vatz teaches political persuasion at Towson University and is author of The Only Authentic Book of Persuasion.